Even comedian Ben Phiri and a ‘foreigner’ Taundi appointed in Sata’s government. 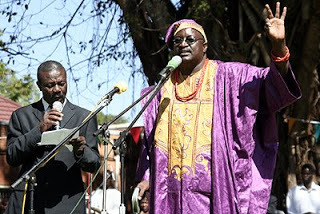 Ailing dictator Michael Sata has appointed and sworn-in a fellow clown and comedian Ben Phiri as Luapula province permanent secretary, old relic Timothy Walamba as Zambia’s high commissioner to Ghana and Brig. Gen. Patrick Tembo as high commissioner to India. Mr. Sata, a comedian and clown himself has also again dared the opposition by appointing MMD Mangango MP Robert Taundi Chiseke as Chiefs and Traditional affairs deputy minister. Mr. Taundi is the MP Mr. Sata was always criticizing former president Rupiah Banda for having adopted someone from Angolan’s Mayukwayukwa refuge camp. The PF have even petitioned the election of Mr. Taundi because they claimed he was a foreigner. Brig. Gen. Tembo from Zambia Airforce (rtd) was deputy High commissioner to Ethiopia who is married to Mr. Sata’s niece. It was felt that India needed a family member who could trusted to keep secrets concerning Sata’s regular treatments. The appointment of another opposition MP means PF are fast gaining the required parliamentary majority to push any legislation they want including the constitution. The Watchdog is reliably informed that there are about 10 more MPs that are likely to close over to PF in the next few weeks in time for constitutional reforms that are due in June this year. And Mr. Sata has also sworn-in as State counsel are DPP Mutembo Nchito’s elder brother Nchima Nchito and Robert Simeza.